The Mafia Commission Trial (February 25, 1985 – November 19, 1986), officially known as United States v. Anthony Salerno, et al., was a criminal trial in New York City, United States. Using evidence obtained by the Federal Bureau of Investigation, eleven organized crime figures, including the heads of New York's so-called "Five Families," were indicted by United States Attorney Rudolph Giuliani under the Racketeer Influenced and Corrupt Organizations Act (RICO) on charges including extortion, labor racketeering, and murder for hire. The case struck a blow against "The Commission," a loose organization of the New York Mafia organizations that met to resolve disputes or discuss criminal activities, sometimes likened to organized crime's board of directors. Time magazine called this "Case of Cases" possibly "the most significant assault on the infrastructure of organized crime since the high command of the Chicago Mafia was swept away in 1943," and quoted Giuliani's stated intention: "Our approach... is to wipe out the five families." 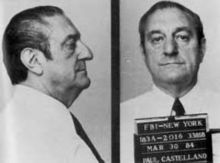 Philip Rastelli was granted a separate trial, Aniello Dellacroce died of cancer on December 2, 1985, and Paul Castellano was murdered two weeks later. The remaining eight defendants were found guilty on all 151 counts on November 19, 1986, and were sentenced on January 13, 1987. The Federal Bureau of Investigation (FBI) had long pursued members of the New York organized crime families through a number of methods, including undercover informants and different types of surveillance. In the Mafia Commission trial, evidence from a number of "bugs" was crucial to the prosecution's case. The first bug, placed in the home of Gambino crime family boss and Commission chairman Paul "Big Paul" Castellano, revealed many of the Commission's criminal operations, such as the "Concrete Club" in which New York's five families controlled the companies and bidding for all construction contracts involving the use of cement/concrete worth $2,000,000 and over. Another bug, the "Jaguar Bug," was placed in the car of Lucchese crime family boss Anthony "Tony Ducks" Corallo. He conducted and spoke about Cosa Nostra business as he was being driven around New York City by his driver and Lucchese family capo Salvatore Avellino. A third bug was placed in the East Harlem Palma Boys Social Club belonging to Genovese crime family boss Anthony "Fat Tony" Salerno. Salerno was the overseer of many of the Five Families joint construction projects. Another well-placed bug was in the ceiling above Colombo crime family acting boss Gennaro "Jerry Lang" Langella's favorite table at the Casa Storta in Bensonhurst, Brooklyn. This bug allowed the FBI to listen in on the acting boss and his top capos and soldiers discuss mob business. The Casa Storta bug also gave the FBI sufficient cause to have a judge order the fifth and final bug which was placed inside the union office of Colombo crime family soldier Ralph Scopo where much of the Commission's "Concrete Club" business was discussed between Scopo and several construction company executives and union representatives. On all the bugs the bosses and their underlings could be heard discussing their individual crime family rackets such as extortion, loansharking, gambling, labor racketeering and also hits that had taken place or been recently ordered. Philip Rastelli was severed from the case to be tried in a different RICO case brought against him and his underboss Joseph "Big Joey" Massino. He was convicted of labor racketeering on January 16, 1987 and sentenced to twelve years, serving five, and was released from prison for humanitarian reasons on July 21, 1991. He died three days later in a Queens hospital at age 73. Niel Dellacroce, the Gambino "underboss," was alleged to have controlled the "blue-collar faction" of the Gambino Family that performed hijacking, robberies, extortion, collecting loan shark debts, gambling operations, and assassinations, was terminally ill with brain cancer. He died on December 2, 1985. While out on bail, Gambino boss Paul Castellano failed to attend Dellacroce's wake, exacerbating tension within the Gambino family factions. Less than two weeks later, Castellano was murdered, along with underboss Thomas "Tommy" Bilotti, in front of Sparks Steak House in Manhattan by hitmen working for John Gotti on December 16, 1985. At the start of the trial Colombo crime family boss Carmine "Junior" Persico (known to his enemies as "The Snake"), decided to represent himself at trial. The bosses were on trial as the heads of New York's Five Families and the Commission, but defendants Ralph Scopo and Anthony "Bruno" Indelicato were there for different reasons. Ralph Scopo was a "made man", a soldier in the Colombo crime family, and the president of the New York Concrete District Workers Council, the union whose members were a vital cog in every significant construction development in New York City. The union leader represented thousands of laborers needed for constructing foundations, walls, and floors, the guts of every high-rise commercial and residential building in Manhattan, thus his importance as the overseer of the Commission's "Concrete Club" and the Five Families' other construction rackets. Anthony "Bruno" Indelicato was a Cosa Nostra legend in the making. His father, Alphonse "Sonny Red" Indelicato, had been one of the Bonanno family capos who sided with sitting boss Philip "Rusty" Rastelli to assassinate usurper and de facto boss Carmine "The Cigar" Galante on July 12, 1979. 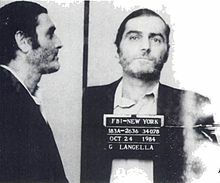 Alphonse Indelicato was also one of the five renegade Bonanno family capos who a short time later turned on Rastelli during the "Bonanno Factions War" from 1979–1981 and was assassinated with two of the other renegade capos on May 5, 1981. Anthony Indelicato was chosen to be a shooter in one of the most famous Cosa Nostra hits in history. One New York City police captain summed up Carmine Galante in a few words, "He's pure steel, the rest are copper!" Anthony Indelicato was sitting at the defense table with the bosses because he was the person who killed Galante in Joe and Mary's Italian Restaurant on Knickerbocker Ave. in Bushwick, Brooklyn on July 12, 1979. When defense attorneys reviewed the evidence, they knew their clients' chances were slim at best. However, when they sounded out Giuliani for plea bargain terms, Giuliani demanded that the defendants plead guilty to the stiffest charges in the indictment, which carried sentences that would all but assure they would die in prison. The seven defense attorneys and Persico's legal adviser decided to argue that membership in the Mafia and membership in the Commission were not in and of themselves evidence of criminal activity. The mafiosi were reluctant to agree to this, believing it would violate the code of omertà. However, the lawyers impressed upon their clients that there was no way they could credibly deny the Mafia existed in the face of their own recorded references to it. They ultimately agreed to this tactic as long as they did not have to personally make statements to that effect on the stand. The upshot of this was the first admission in open court that the Mafia existed. The trial lasted 3 months from September until November 19, 1986 when the jury came back with their guilty verdicts for all eight defendants on all 151 counts in the indictment. On January 13, 1987 the defendants were in front of the sentencing judge to hear what their fate was to be for this historic Cosa Nostra case. The bosses all received 100-year sentences, the maximum available under RICO. Colombo family soldier Ralph Scopo also received 100 years. Bonanno family soldier Anthony Indelicato received a 45-year sentence. Note: Indelicato served 13 years and was released in 2000 on parole, but returned to prison in summer 2001 for eight months after violating parole by meeting with known Bonanno family members. He then served 2 more years for a parole violation in February 2004. On December 16, 2008, he was sentenced to 20 years in federal prison for the 2001 murder of Frank Santoro. The case marked the first successful large-scale use of RICO against the Mafia. It severely crippled the Five Families by permanently imprisoning several of their top leaders. For instance, the Lucchese family saw its entire hierarchy sent to prison for life. The convictions were all upheld on appeal. Not long after the trial, Salerno's former aide, Vincent "Fish" Cafaro, turned informer and revealed that Salerno had merely been a front for the real boss of the Genovese family, Vincent "Chin" Gigante. This disclosure, however, did not jeopardize Salerno's conviction; he had been found guilty of specific criminal acts and not merely of being a boss. It was also one of several high-profile victories for Giuliani, establishing his strong name recognition and providing a public platform for his first run for Mayor of New York City in 1989. The lead prosecutor in the trial, Michael Chertoff, eventually went on to become United States Secretary of Homeland Security. ^ Stengel, Richard. Stengel, Richard (June 24, 2001). "The Passionate Prosecutor". Time. Retrieved 2006-11-15. Time Magazine online, posted June 24, 2001. ^ "Legendary New York Mob Boss Carmine Persico, Head of Colombo Family, Dead at Age 85". nbcnewyork.com. 7 March 2019. Magnuson, Ed. Magnuson, Ed (June 24, 2001). "Hitting the Mafia". Time. Retrieved 2006-11-15. Time.com January 24, 2001.